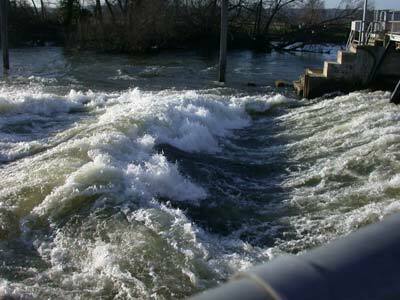 Description: A weir with a lot of paddling history, redeveloped to create a wave with canoeists in mind. This redevelopment work consisted of bolting pneumatically adjustable ramps to the weir sill in front of all four of the main gates. At rest the ramps lie at 17 degrees. At maximum elevation I believe they can be raised to 35 degrees. This range is enough to create a surfable wave in most conditions whilst the gates are open. The ramps are set at optimum level and the new modifications mean that each ramp can be left set between adjustment times. (they are only adjusted during Chalfont Park Canoe Club sessions on Sunday mornings from 11.00 and Wednesday evenings from 5.00). The wave created on the weir is, even with fine tuning of the ramps; large, powerful, surgy and unpredictable. There are also some challenging eddy lines to cross – not great for the easily spooked. The better paddlers will be able to do a few “moves” in certain conditions but it is often a case of a quick but very exciting front surf. Some people like that kind of thing though and on 2, 3 or 4 gates open it is good fun for a short while, especially if the queue at Hurley is large. When both Hurley and Hambleden are on 1 gate, it is probably best to go to Hambleden during the times when the ramps are in use. Hambleden weir washes out quite quickly in flood conditions. If Hurley is on four, Hambleden will be gasping for air. Directions: Follow the directions for Hurley from the A404, but instead of turning off into Hurley village keep driving towards Henley. After a mile or two you will see a right turn signed to Aston, the road is called Aston Ferry Lane off of the A4130 (it is very easy to miss this sign – keeps your eyes open, but if you end up by the Shell Garage you have gone to far so turn around). Drive down there, pass the pub, and keep going all the way to the slipway at the end. Put in and paddle up to your left. If there is too much flow to paddle you can just walk up to the lock and put in there.